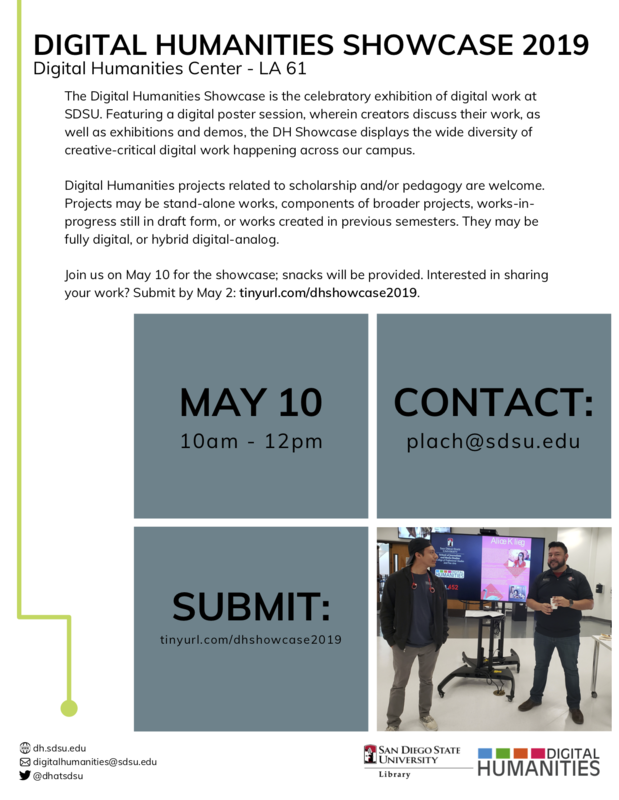 The Digital Humanities Showcase is the celebratory exhibition of digital work at SDSU. Featuring a digital poster session, wherein creators discuss their work, as well as exhibitions and demos, the DH Showcase displays the wide diversity of creative-critical digital work happening across our campus. Digital Humanities projects related to scholarship and/or pedagogy are welcome. Projects may be stand-alone works, components of broader projects, works-in-progress still in draft form, or works created in previous semesters. They may be fully digital, or hybrid digital-analog. This event is part of the Research and Development Track in the Digital Humanities Center. We provide opportunities for faculty and students to present their work as well as continue learning, develop research, and collaborate. For other tracks and events, visit our Events and Activities page.